The Mini WiFi-101 is a small and robust Wifi LED Controller full of functionality. After downloading the free ' L-Home' smart phone app and registering, the user can control 12-24VDC RGBW, RGBWW, RGB, and two tone LED strip lights, modules, or wall washers from their iOS or android device. Functionality of the controller includes 7 pre-programmed color changing modes, 9 DIY modes, static color options, as well as music and microphone control. Choose your favorite modes and play them in sequence, or activate the audio function for audio effects in real time reacting to the current color changing mode selected. This mini controller requires a wireless router to operate and is intended for homes or small business with only a few network devices. The manufacturer recommends that no more than 4 controllers be connected through a standard wireless router. Each WiFi Controller, 4 max, can be controlled as it's own device through the smart phone app. Please note that the controllers do not sync with one another and can only be controlled independently. 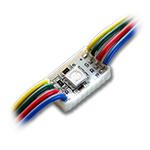 Each WIfi LED Controller can control up to 3A x 4CH when using RGBW products or 3A x 3CH when using RGB products. 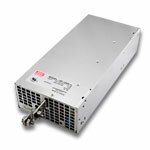 This product is intended for small home networks with minimal network devices. The manufacturer recommends no more than 4 controllers per wireless router. This innovative 4 color RGBW LED Strip Light combines RGB and White into a single 4 in 1 style 5050 LED Chip for brilliant color lighting and effects with the addition of a true cool white (6000-6500K) output. 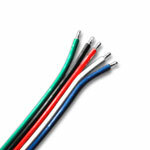 With ordinary RGB strip lights colors like white and warm white are nearly impossible to achieve. With the 4 in 1 RGBW strip light you can choose from colored lighting for certain events or holidays, and then switch your lighting to a cool white output when functional lighting is needed, or you can always combine the RGB and white output for over 4 billion color options. The ETL Listed RGBW LED Strip has (6) 4 in 1 RGBW 5050 LED Chips every 4 inches, making the outputs twice as dense as our standard RGBW strip. Cut this strip light every 4 inches and reconnect by soldering bare wires to the copper pads surrounding the cut points. Each 118" roll comes with 3M™ mounting tape on the back, for the best long-term mounting solution. 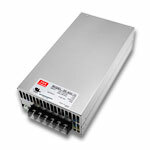 51W of constant voltage 24VDC power is needed for each 118" strip (5.1W per foot). The LED Strip Light can be controlled using our 4 Channel RGBW Controllers or through 4 DMX channels in a DMX universe. For optimal light output we recommend you connect these lights no longer than 30ft in series. 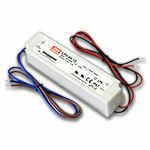 This strip light is ETL Listed, RoHS and CE approved. This innovative 4 color RGBWW LED Strip Light combines RGB and Warm White into a single 4 in 1 style 5050 LED Chip for brilliant color lighting and effects with the addition of a true warm white (2800-3200K) output. 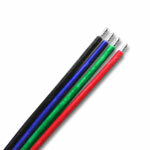 With ordinary RGB strip lights colors like white and warm white are nearly impossible to achieve. With the 4 in 1 RGBWW strip light you can choose from colored lighting for certain events or holidays, and then switch your lighting to a warm white output when functional lighting is needed, or you can always combine the RGB and warm white output for over 4 billion color options. The ETL Listed RGBWW LED Strip has (6) 4 in 1 RGBWW 5050 LED Chips every 4 inches, making the outputs twice as dense as our standard RGBWW strip. Cut this strip light every 4 inches and reconnect by soldering bare wires to the copper pads surrounding the cut points. Each 118" roll comes with 3M™ mounting tape on the back, for the best long-term mounting solution. 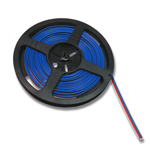 51W of constant voltage 24VDC power is needed for each 118" strip (5.1W per foot). The LED Strip Light can be controlled using our 4 Channel RGBW Controllers or through 4 DMX channels in a DMX universe. For optimal light output we recommend you connect these lights no longer than 30ft in series. 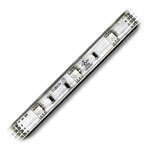 This strip light is ETL Listed, RoHS and CE approved.